This Girls Easter Bunny Dress is perfect for welcoming Spring on Easter Sunday! 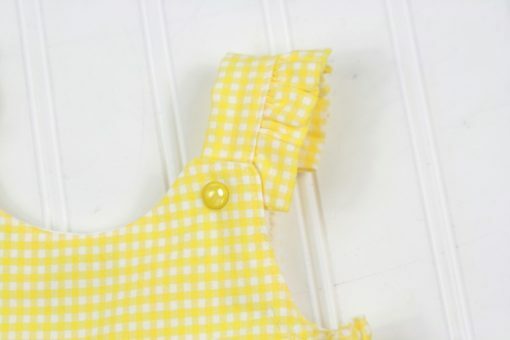 The peppy yellow gingham is a perfect match to the bright blue floral skirt, and a perfect backdrop for a monogram (maybe hot pink, or royal blue!) 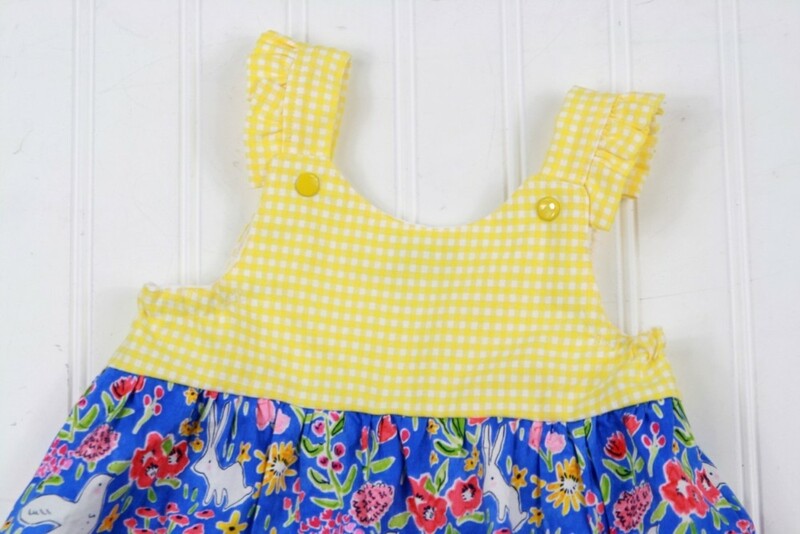 She will be the star of the show as she shows off her ruffled straps and twirls and twirls! 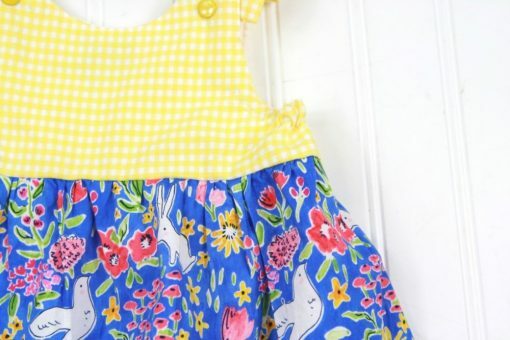 The pattern features bunnies but is also a scene that works all spring and summer long! 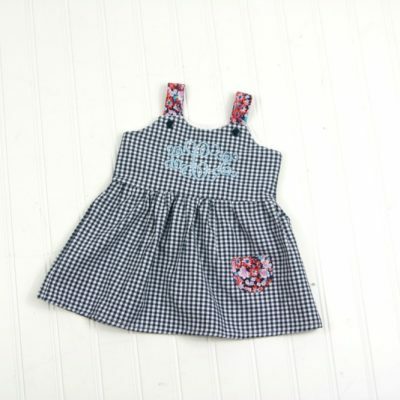 The dress is 100% cotton, with the yellow gingham bodice lined in 100% white cotton. 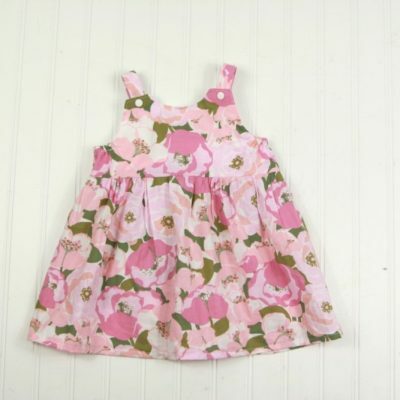 The straps boast the matching fabric ruffles, and snap on and off at the chest. 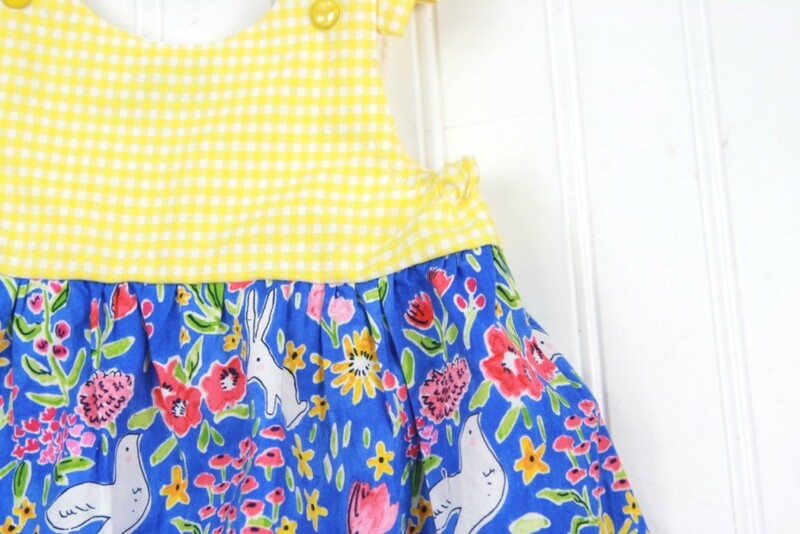 The skirt material features a fun spring scene filled with doves, bunnies, and flowers. The skirt is gathered for a fun and flattering fit! 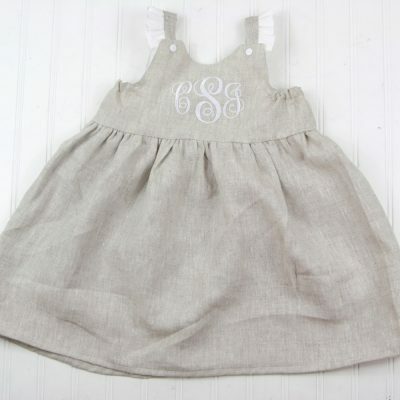 OPTIONS: You can order the outfit to be plain (without embroidery), or add a name, or initials. 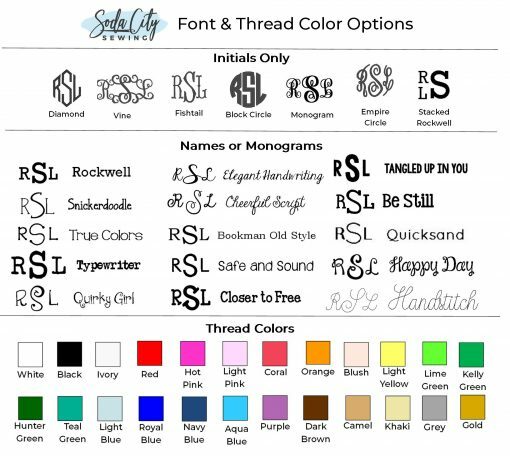 Select your options as you put the dress in your cart. HANDMADE IN SOUTH CAROLINA: All of our dresses are handmade by a member of the Soda City Sewing team! 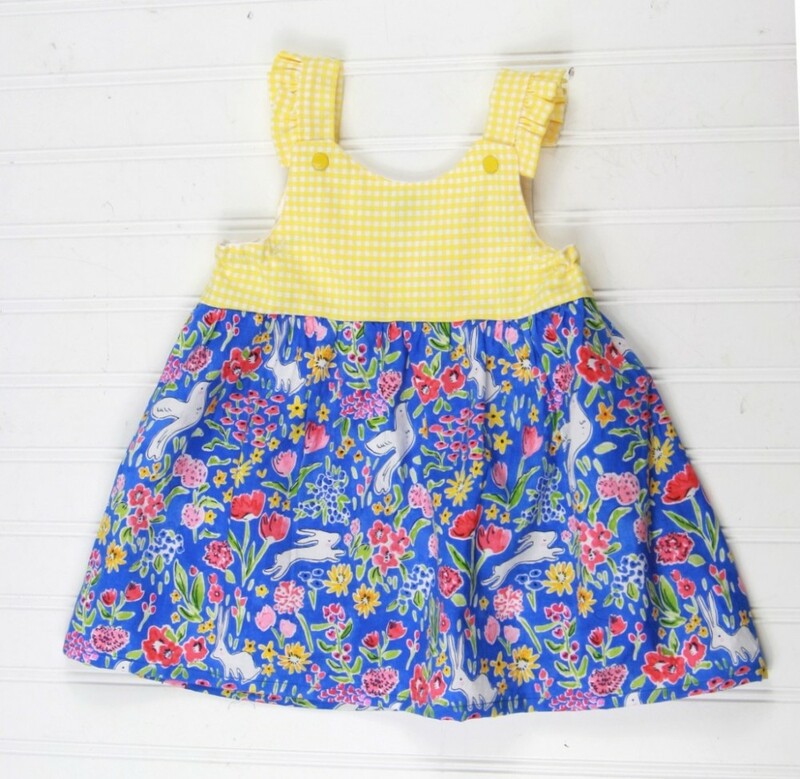 We employ stay at home moms, students, and part time seamstresses to help us put together our clothes, and pay them a fair wage. 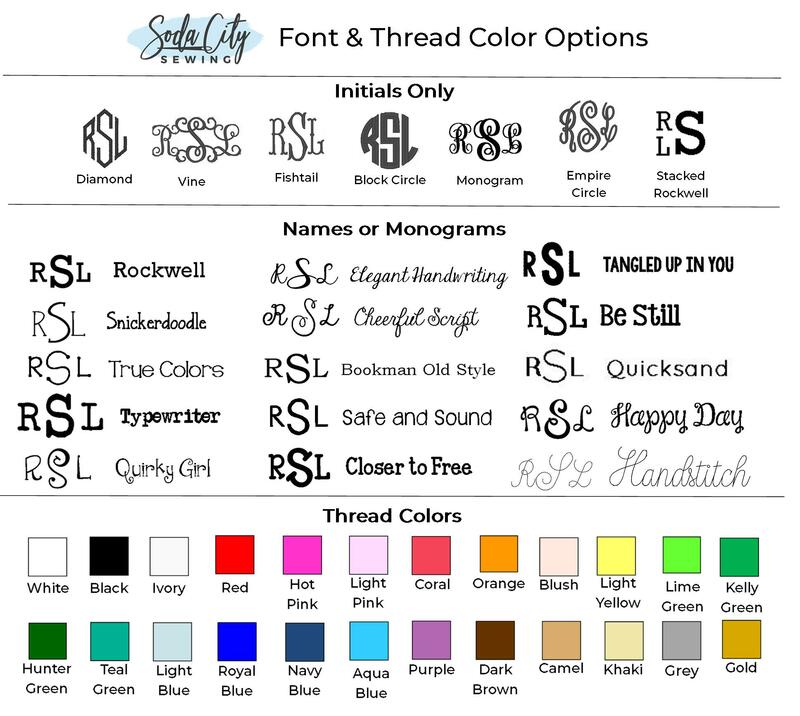 You’ll love the quality of our items and the customization being made in the USA affords you! 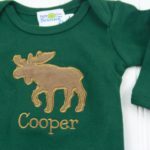 Thanks for supporting small businesses! 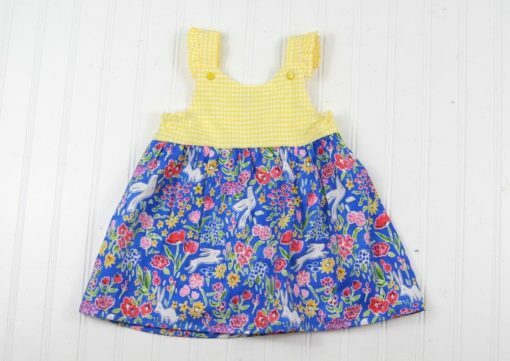 Thanks for visiting Soda City Sewing, where we would love to make a girls Easter bunny dress for your special girl!